The follow-up to Acid Rap could be on the way. We haven't had a full solo release from Chance The Rapper since 2013's Acid Rap. 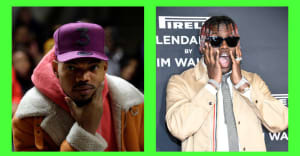 However, the Chicago rapper has shared new songs on SNL, The Late Show with Stephen Colbert, made a mixtape with Lil B, and spent a lot of time on important stuff besides music. Today on his Snapchat, Chance shared a few brief samples of some new music. Are the solo tracks, or more work from The Social Experiment, Chance's collective that released the amazing Surf last year? Watch them above via Pigeons & Planes and the Social Experiment's FADER cover story.